I want to express my appreciation for your trust and willingness to work with my office to reach an agreement that benefits all parties. I gave you my personal commitment to amend AB 1250 in the Senate to remove all cities from the bill. In addition, thank you for negotiating with the California Contract Cities Association to take a neutral position. Again, I appreciate your firm’s trust and confidence. 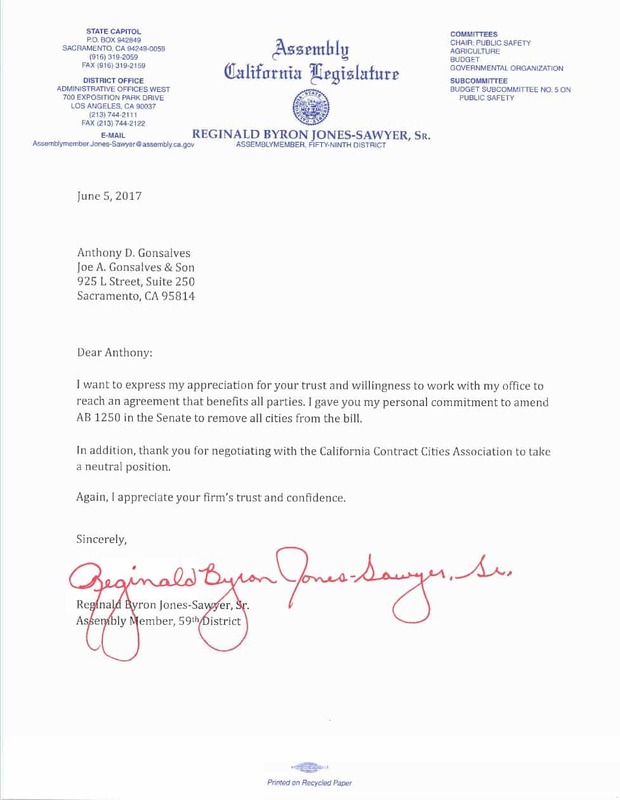 Assembly Member Reginald Byron Jones Sawyer, Sr.
After several weeks of negotiating, battling, advocating and a few marathon Assembly floor sessions, we are pleased to inform you Assemblymember Jones-Sawyer has committed to remove cities from AB1250. By way of process, the bill cannot be amended this evening, therefore the Author, Assembly leadership and sponsors have committed to amend the bill once it moves to the Senate, a commitment we appreciate and absolutely trust. This is a victory for all cities throughout California; it was hard fought and could not have been accomplished without your vocal opposition…THANK YOU! In addition, we would be remised if we didn’t take a moment to thank the Members of the Assembly, the Democratic leadership, the entire Democratic caucus and Republican caucus who supported their cities during one of the most contentious local government vs. labor battles in recent times. Please take a moment to thank your legislators for their support! Should you have any questions or concerns please do not hesitate to contact our office. Again, thank you for your trust, confidence and vocal opposition. As we previously reported late last Thursday (please see attached memo), Assemblymember Jones-Sawyer has agreed to remove cities from AB 1250 entirely. This is a significant victory for cities and one that was the result of several weeks of tireless advocacy in Sacramento and in the Assemblymember’s districts. While the bill was not put up for a vote prior to agreeing to remove cities, our unofficial “lobbying” roll call had the bill significantly lacking the 41 votes necessary for passage (we had the bill at < 25 aye votes). Recognizing the intensity surrounding the bill, we thought we should re-send the attached memo as well as a memo that the Assembly Democratic leadership requested we submit prior to the bill being taken up late Thursday evening. We delivered the memo to the Capitol, removing our opposition, they made 80 copies in the Speaker’s office, and the bill passed out of the Assembly just after 8 pm last Thursday. Again, this is a significant victory that would not have happened without your support, our coalition partners, the League of California Cities and the California Contract Cities Association. On behalf of our clients, Willdan Group Inc. and the cities of Atascadero, Azusa, Bellflower, Camarillo, Chino, Claremont, Coachella, Concord, Diamond Bar, Eastvale, Elk Grove, Fillmore, Folsom, Glendora, Indian Wells, Industry, Irwindale, Jurupa Valley, La Mirada, La Quinta, Laguna Hills, Lakewood, Mission Viejo, Moreno Valley, Norwalk, Palm Desert, Paramount, Rancho Cordova, Rancho Cucamonga, Rosemead, Santa Fe Springs, Signal Hill, South Gate, Thousand Oaks, Torrance, and at the request of the California Contract Cities Association, we remove our opposition to AB 1250 by Assembly Member Jones-Sawyer. We very much appreciate your commitment to remove all references to cities in AB 1250 once the bill moves over to the Senate. We thank you and your colleagues for your continued support of local governments. As you know, AB 1250 (Jones-Sawyer) was heard today in the Assembly Public Employees Retirement and Social Security Committee. The bill was defeated and the Author requested reconsideration and it was granted by the committee chair. We would like to thank Assemblymembers Cervantes and Cooley for not supporting the bill. It was their 2 votes that kept the bill from getting out of the committee. 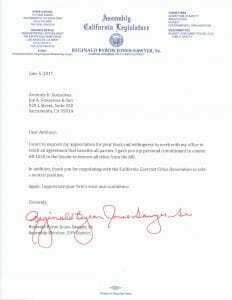 Since AB 1250 was granted reconsideration; the Author has requested that I personally meet with him and the sponsors on Monday, April 24th to see if we can find a win/win solution for everyone.